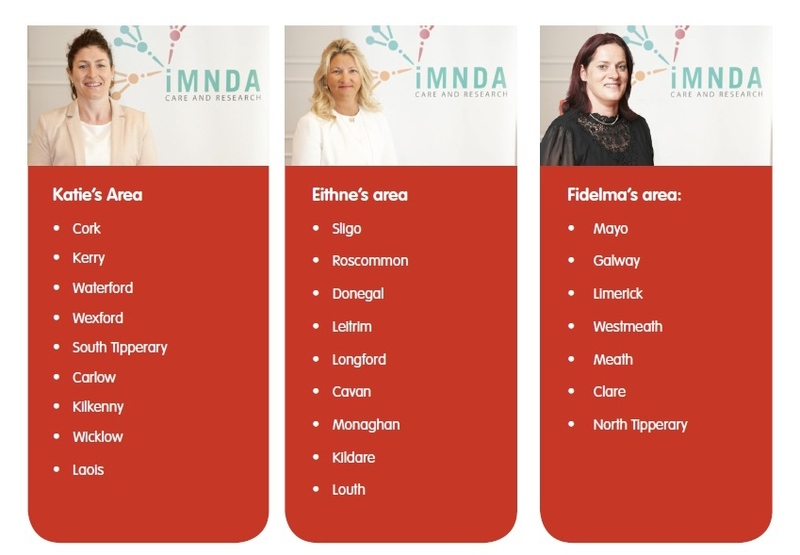 The IMNDA is here to help once you or someone you know has been diagnosed with MND. We are dedicated to working on behalf of and supporting people living with MND, their families and carers. Whether yourself or someone you know has been diagnosed with MND our information services can make a real difference in how you cope going forward. We work closely with local service providers to ensure you get the care and support you need. You can register yourself or a healthcare professional or a family member can register on your behalf once your consent is given. Registration is free and details are completely confidential. To register you can contact the IMNDA on Freefone 1800 403 403 or you can send us an email to services@imnda.ie. We will ask for a small amount of detail for our registration form which will include: contact details, date and place of diagnosis and symptoms. Once this is completed, one of our MND nurses will aim to contact you within a week unless you request no contact. The MND nurses are central to the patient and family. They are also vital for links out to all of the services and health care professionals. They endeavour to co-ordinate a service that provides continuity of care for a case load of patients in collaboration with local health care professionals and carers, especially those with specific palliative care needs. The role applies to acute and community care settings. The nurses act as an informed resource for health and social care professionals, involved in the care of the clients living with MND. The IMNDA provides financial assistance towards home care for people with MND. To arrange home care assistance for a person with MND, please contact us on Freefone 1800 403 403. We do not recommend any specific carers or care agencies but please find below details of agencies some of our client group have previously used. To find a carer, you can also ask your local public health nurse or health centre. Home Instead Senior Care® is a HSE approved provider of home care in all areas of the country. Our professional CAREGivers can provide 24 Hour Companionship & Personal Care Services together with Motor Neurone, Alzheimer’s & other Dementia Support as well as Palliative Care and Hospital Discharge Assistance. Neither giving nor receiving care is easy. Home Instead Senior Care® puts relationships first in order to protect the dignity of those receiving care, to support those providing care; ultimately enhancing the quality of life of both those we care for and their families. Phone: 1890 930 847 or Visit www.homeinstead.ie to contact your local office for a free care consultation. Caremark provides care and support for anyone who wishes to remain in their own home, regardless of their illness, disability or situation. Caremark currently offers care and support in Dublin, Cork, Galway, Kildare, Westmeath, Longford and Roscommon. Homecare Independent Living (HCIL) is a national leader in providing homecare services to clients, enabling them to continue living with dignity and independence, in their own homes. Our services include 24 hour domiciliary care, peripatetic care, floating support and nursing, as well as respite care. Supported by a team of over 1,000 staff and more than 20 years in the market, with a reputation built on trust, quality and innovation, our clients are at the center of everything we do at HCIL. Be Independent Home Care is a Nurse Owned and Managed Home Care Company. Our team of qualified and supervised Home Care Assistants operate in homes throughout Dublin. We are approved HSE Homecare Providers and our team of Care Assistants are fully trained, reference checked, insured and Garda Vetted and work in strict adherence to our policies, procedures and guidelines. We recognise that each one of our clients has individual needs and so tailor our services to each client by carrying out a full initial needs assessment. Often our clients simply need help with things like washing, dressing, mobility assistance or meal preparation and as our home care services range from just a few hours a day up to overnight or full time care, this allows you to decide how much support you require. The Multi-Disciplinary Team (MDT) comprises of a group of clinical professionals with specific expertise in MND who work in a hospital and community setting. The IMNDA links in with these healthcare professionals but they are not employed by us. They include; Neurologist, Occupational Therapist (OT), Public Health Nurse (PHN), Social Worker, Physiotherapist, Speech & Language Therapist (SLT) Dietician, Counsellor and GP. They work as an integrated unit and their aim is to provide flexible and rapid accessible care for people with MND, their families and carers. The type of multidisciplinary expertise required by people with MND will vary depending on the stage of the illness. They can help with difficulties with every day things such as personal care, climbing the stairs, mobility support etc. Diagnosis of a fatal illness with a shortened life expectancy can lead to significant stress. Underlying relationship or marital problems can be uncovered as a result of the stress of illness. Appropriate referral to a qualified counselling service is essential for people with MND and families experiencing such difficulties. We hope that this new Family Caregiver Support Program will be of benefit to carers right across Ireland over the coming months. We truly respect and appreciate the enormous impact that caregivers have on the lives of their loved ones on a daily basis. If you or your main caregiver would like more information on the Family Caregiver Support Program, please do not hesitate to contact Johanna, our Information and Support Officer, on (01) 871 7800 or email services@imnda.ie and put Family Caregiver Support Program in the subject line. Caring for Carers , is a new website dedicated to carers and family specifically caring for those with palliative care needs. The website consists of 8 different sections and contains videos, downloads, links and lots of practical information to support family carers as they support a person who needs palliative care. Caring for Carers was created by a team led by Professor Peter Hudson from Queen’s University Belfast in collaboration with AIIHPC and a working group made up of family carers and former carers, carer organisations, health and social care professionals and charities. The site is hosted on www.thepalliativehub.com an all-island gateway to palliative care information. For more see HERE.